Whether you’re looking to train, get fit, socialise or simply relax, Burntwood Leisure Centre is the venue for you. It offers a wide range of coaching courses, holiday activities and children’s parties. 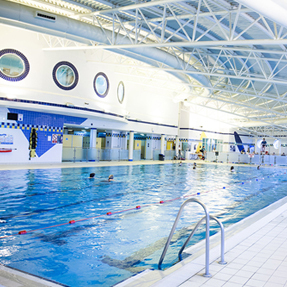 Burntwood Leisure Centre has two swimming pools: a 25m, six-lane pool and a shallow toddler/training pool, for public swimming, swimming clubs, swimming lessons and family fun sessions. The large, four-court sports hall is well equipped for a range of activities including 5-a-side football, basketball and badminton. It’s available for clubs to hire use. A 55-station air conditioned gym with state-of-the-art resistance machines and free weights. It also features a health suite complete with a spa, steam room and sauna. Offering around 50 classes a week, the two dedicated fitness studios has a full programme. Classes are included in leisure memberships and can be booked over the phone or at reception. The smart meeting room can accommodate up to 35 people and is available to hire. The third generation, floodlit synthetic football pitch was refurbished in 2016 and can be hired in thirds. There are also full sized grass football pitches available to hire. Floodlit tennis courts and a multi-use games area.